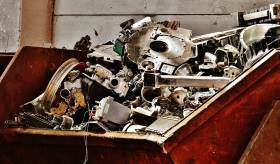 When you have a cleanup project or if you’re planning a remodel, you’ll likely need to rent a dumpster in order to easily haul away all of the garbage and old house fixtures. Many people assume that bigger is better when it comes to dumpster rentals, but that it is not necessarily true. There are many reasons why you may be better off going with a smaller dumpster rental for your home projects. Bigger dumpsters mean bigger price tags. No one wants to spend the extra money for a huge dumpster only to realize that they can barely fill up half of it. Smaller dumpster rentals are cheaper, and there’s less of a chance that you’ll waste money on unnecessary space. As a rule of thumb, 30 to 40 yard dumpsters are typically reserved for massive haul-away projects, such as instances of hoarding and full home remodels, and commercial purposes. Most residential home projects, such remodeling a few rooms or cleaning out a shed or garage, only require 10 to 20 yard dumpsters. If you discover that you bit off more than you can chew and the smaller dumpster wasn’t enough, the rental company can either empty the dumpster for you and return it or you can rent another one. Dumpsters are almost always placed in the driveway. It’s a very convenient spot since it usually has direct access to the front door, garage or shed, and it allows you to easily remove and place the dumpster without tearing up your lawn. However, larger dumpsters eat up a lot of driveway space, preventing you, people living in the home and anyone helping with the project from parking in the driveway. Not only is this an annoyance, but it could also be a safety hazard and a nuisance to people on the road if you have to park in the street. In addition, larger and heavier dumpsters may damage your driveway when being delivered, moved and taken away. A smaller dumpster frees up space in the driveway for both cars and people, and the lighter weight helps prevent them from damaging the asphalt. Large dumpsters are a major eyesore in your yard. While this may not be a big deal for smaller projects or quick cleanups, there are many projects that can last days, weeks or even months. You’d be hard-pressed to ever find a dumpster that’s visually appealing, but smaller dumpsters are much less of an eyesore on your property than large ones. If necessary, they’re also a lot easier to conceal from neighbors. Many people rent large dumpsters because they have a few items that they need to discard that seem like they’d be too big to fit in a smaller dumpster. Once the items are in the dumpster, they find that it was more than enough to accommodate the items and the excess space was wasted. You can fit several appliances and pieces of furniture in 10 to 20 yard dumpsters with room to spare for excess garbage. Large dumpsters can be a hassle to deliver and pickup, and it takes much longer for them to be emptied and returned. Smaller dumpsters are usually ready for use a few minutes after delivery, and emptying and returning them is much quicker and easier. This post is written by American Junk. If you're moving, or just need junk hauled, take a look over at American Junk. American Junk is an all-inclusive junk removal service focusing on both residential and commercial locations. As we approach another winter and the cold days arrive along with the long, dark nights, there are a few trends to a home extension to look out for. Whether you are looking to add a splash of colour to liven up a dark and dreary kitchen space, or you want to bring in plenty of light to brighten up those long winter nights through the exposure an elegant roof lantern can bring to a dining room extension, there are a few options to look out for. Don’t be afraid to be bold with your home extension design and refurbishment plans. A Colourful Kitchen Extension – One of the biggest design trends for home extensions this winter is to build a kitchen full of colour and vibrancy. Choose to work with stone and metal worktops, matching cupboard doors to the surfaces and combine it all with classy, earthy colours that will last as a classic for years to come. Bring in Plenty of Natural Light – One of the best ways to spruce up your home extension is to increase the maximum amount of natural light that the space receives. Illuminating your kitchen is a great way to improve the atmosphere and is one of the key trends of Winter 2017 in bringing about a cosy atmosphere for the entire family to enjoy! A roof lantern can be built in to your flat roof extension, adding a layer of elegance and sophistication, as well as providing the portal where natural light can stream into your extension. It doesn’t matter whether you are planning on building a kitchen, extra living room space, a dining area or games room, the more natural light evident, the better for the atmosphere and the mental wellbeing of all those who live at the property. Clever Storage Space – We all want more storage and one of the key trends this winter regarding home extensions is to include sensible and creative storage space as part of the design. If you are building a kitchen extension this will include units with built-in hooks to house spare utensils and towels, or storage cupboards built-in to cabinets and surfaces so you can keep extra space for the extension to feel clutter-free. Bring the Garden Inside – One of the biggest trends for this year as a whole has been for an extension to be the perfect gateway between the house and the back garden. No matter the purpose of your extension, and with a roof lantern brining in plenty of natural light, why not open out into the garden with bi-fold doors and have plenty of plants and greenery in the extension space to complement your garden. One of the most beneficial aspects of the design trends for 2017 in terms of home extensions is the part that includes roof lanterns as part of a flat roof extension. As you can see, there are a few different ways in which you can add a bit of flair, colour and light to your home through design trends that can make a real difference to your home extension. A roof lantern however, is the only trend that can really bring in much needed light and warmth at a time of year when you need it the most, and all through being the conduit natural light can filter into the house through. Work alongside a specialist roof lantern and skylight supplier and you’ll soon add that little bit of luxury that puts you in the vanguard of design and home extension trends for Winter 2017! Central air conditioning unit installation can be a complex process. Removing an older, less efficient unit for replacement with a more efficient system can also involve changing ductwork and electrical lines. The trained and skilled technicians at Howard Air have the professional experience to do the job right every time. Since HVAC unit installation is such an investment, you need to be certain your old air conditioner is ready to be replaced. Humidity: Increasing humidity means your central AC has difficulty removing all the moisture from treated air. Unexpected noises: Any change in the pattern of sounds coming from your system can indicate that age has caught up with some of the parts. Short-cycling: As a central AC system fails, it has trouble keeping up with cooling demands. Age: Even the best AC systems do not last forever; you can generally expect around 15 years of reliable, efficient service before age increases repair costs and repair visits. Old refrigerant: To help protect our earth’s fragile atmosphere, old refrigerant has been phased out, to be replaced with less destructive R410A refrigerant. Your old system could be harming our Arizona air. A new central air conditioner is a great investment in your family’s comfort and safety. Your home’s furnishings benefit, too, with the less humid air and more finely regulated temperatures. Everyone breathes easier with a new AC system, including you at bill-paying time, when you notice lower energy costs attributable to a more efficient unit. For professional AC unit installation in Phoenix, please consider Howard Air. We have installed and serviced thousands of systems over the years in the Valley of the Sun and our name is trusted throughout the metro area. Installing a furnace may seem a low priority for Phoenix residents, but Arizona’s cool winter nights can remind us all how handy a furnace is to have. Age: A system older than 15 years is energy-inefficient. High gas bills: Large increases in your monthly bills may indicate a system running inefficiently. 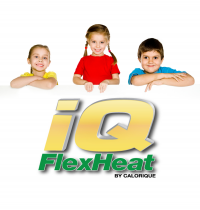 Uneven heating: Cold rooms adjacent to overheated rooms signal trouble. For professional furnace installation, Phoenix homeowners know to turn to Howard Air. 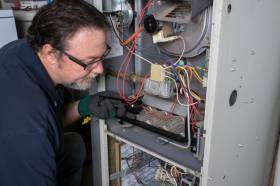 Our professional technicians will ensure your new unit is installed correctly to work efficiently for years to come. Installing a heat pump is as complicated as installing a central air conditioning unit or furnace, and is best left to professional heat pump installers with the experience and training to do the work correctly the first time. For heat pump installation in Phoenix, trust the local, dependable contractor so many fellow Phoenicians have used; trust Howard Air. Need installation on your AC unit, furnance or heat pump? Contact the proffesionals at Howard Air. Buying a home is likely to be the biggest decision a person makes in their life. This is a major commitment and it is also likely to be the most expensive purchase a person makes. This means you need to ensure your finances are in a good place and long before you start to seriously look at properties, you need to review your budget, improve your finances, build some savings and improve your credit score. You need to pay out a lot of money every month when you own a home and while no one can tell what is going to happen in the future, it is essential that buyers understand how much money they need to earn each month to cover these payments. Of course, if all you had to worry about was the monthly payments, life would be quite simple. Unfortunately, there are also a number of upfront costs to deal with when buying a home. This can place you under considerable pressure during one of the most stressful periods of your life. Solicitors don’t provide services out of the goodness of their heart, they have to be paid for the work and time they provide. Given that the deal cannot be concluded until the solicitor settles up with the mortgage firm and other parties, you need to make sure that you can pay your solicitor. It is likely that you’ll need to have some form of survey or report undertaken of the property and again, this doesn’t come for free. The overall fee will depend on various factors, including the fees of the firm and the size of the home. If you buy a home that costs more than £120,000; you will be entitled to pay stamp duty on the property and this is expected to be paid to HMRC within 30 days of the property deal being concluded. This doesn’t give much time to arrange funds to make the payment. Don’t forget that if you are looking to hire a removals firm to help you into your new home, this will cost you money as well. You may be able to save money by getting friends or family members to pitch in but you’ll find that there will be some cost involved in the moving process. All of these upfront costs can leave you feeling very frustrated and it may place your property plans into jeopardy. This is why it is good to have a Plan B or a helping hand available when you are looking to tie up a property purchase. Having just obtained a mortgage, it is not as if too many people are going to rush into taking out any other form of loan or finance agreement, but it may be that there is an option that will give you the financial flexibility you require. When you need additional funds at short notice but which can be paid back over a longer period of time, a guarantor loan is of benefit. While the process of buying a home should see you considered to be a good credit risk, as you have just bought a property, or waiting to get everything signed off, you don’t want to be seen as placing your credit score at risk. This is why the presence of the guarantor can have a huge impact on your ability to get the funds you need. It is essential that when you are planning to buy a home, you know all of the costs associated with the process. If you only think that the mortgage payments are all you have to worry about, you’ll find that you soon have a number of bills to contend with at short notice. For those in the construction game it is easy to see why so many customers are asking for a roof lantern as an addition to their home, either as part of a orangery, or to place on top of a flat roof extension. A roof lantern is the perfect decorative addition to any home, improving the overall aesthetic of a property as well as adding a range of other benefits to a home. If you can provide roof lanterns as part of your service your company will find a good level of regular custom as a result. In the past the traditional roof lantern would have consisted of glazed sections and decorative frameworks, but now, of course, the modern consumer wants a bit more choice. There is now a wide range of designs to go alongside the traditional roof lantern aesthetic, especially for flat roof applications, ensuring you have a lot more flexibility to offer your client. This not only covers the design of the roof lantern being applied to the extension, but also to the different shapes and sizes that can be constructed and applied to an extension or conservatory. More modern design fits in naturally with the aesthetic of modern buildings generally, allowing a seamless fit with clean, minimalist interiors to conservatories, bi-fold door systems and crystal clear, cutting edge glass. A modern roof lantern can include joint-to-joint clear glass, utilising a base framework only. Even without the full glass roof lantern, the modern designs offer a property much more chance to let in larger quantities of natural light. Your clients can also implement a lighting system that works in tandem with the roof lantern design, with a roof lantern unit including joints to house down lighter wiring, allowing for the whole system to be lit up as the natural daylight fades and evening begins. This offers a sumptuous level of elegance to any property with an extension. Not only can you offer your clients a wider range of designs, shapes and sizes, but also materials that will last a lot longer than traditional roof lantern designs. Over recent years there has been a vast improvement in the design and build of roof lanterns and their application. Whether you choose to use UPVC or aluminium frames you roof lantern will be tighter with regards keeping water out, a higher resistance to the effects of the weather and last for many years to come. Whatever design you offer your client, a roof lantern will provide them with a number of benefits. With the modern design aspects of the size, shape, design and the different types of glass for a roof lantern that can be utilised, there is little reason to worry about the roof lantern’s popularity as an addition to any conservatory or flat roof extension. Adding to the decorative aesthetic of a home helps the customer feel more comfortable in their abode and adds to the valuation of the property. For many professions there is a requirement for tools to be carried around on a regular basis. If you are an individual who works within one of these professions, such as an electrician, builder, decorator, installation person or other tradesperson, or a photographer and other creative occupations, an aluminium case to transport your tools securely could make a massive difference to your ability to perform your job role effectively. There are a few suppliers of high quality aluminium cases, in a wide variety of shapes and sizes that can be utilised for the easy and safe transportation of often expensive and important equipment and tools. If you are on the market for an aluminium case to transport your expensive tools for work purposes, what is it that you are looking for exactly? The first thing you should be searching for is a case that has been designed to last for a long, long time. If you are travelling everyday for work and have to keep your expensive tools and equipment with you as you travel, it is important that you have the strength and flexibility to allow you to do so with complete peace of mind. You know that as you are in transit it is likely that your case will take some bumps, either in your hand or out on the road in your vehicle. Choose an aluminium case that has been designed to withstand those sorts of bumps and bruises without damaging the interior and the equipment it holds. Not only is it important that the case is designed and built in a way that makes it sturdy and difficult to penetrate, no matter the types of bumps it receives, it is also vital that it is easy to carry. If you are in a profession where you are likely to be carrying your equipment all day, every day, walking over long distances at times, and lugging the case up and down stairs, the last thing you need is to be carrying a case that is both cumbersome and heavy. With that in mind, look for an aluminium transportation case that fits the bill, providing you with the strength of security but the lightweight nature and flexibility that allow you the comfort of knowing you will be able to easily carry it over long distances and for many hours each day at work if necessary. A good aluminium transit case will do the job to help you keep your tools secure each day, but why not go that extra bit further and ensure there is virtually no chance of your equipment being damaged whilst inside the case? There are companies that can provide not only an aluminium case to transport your goods securely, but also provide custom foam inserts that are designed and applied to the exact specification of your tools, ensuring that they fit snugly inside the case and are prepared for any impact. Regardless of where you live, home break-ins are a common concern amongst homeowners. Homes experience burglaries far more often that commercial properties, with one home burglary occurring approximately every 13 seconds in the United States. Even if you are away from home at the time of the break-in, it can impede you and your family’s sense of safety. Fortunately, there are several methods you employ now to discourage burglaries. Here are some ways you can keep your family and valuables safe from harm. It is easier to break into a home when a burglar knows no one is home. Therefore, burglars are most likely to break into homes when they know the owner is away. Some even scout neighborhoods in an effort to note when most people are away at work. Whether you’ve gone to work or on vacation, make it appear as if someone is there. Install automatic light timers automatically turn the lights on and off on a similar schedule to your daily use. Also, have a neighbor pick up your mail and place your garbage cans out on trash day. Some families choose to hide a spare key in a secret place outside, in case someone forgets theirs when no one is home. This is never a good idea. Your hiding spot by not be as inconspicuous as you believe it to be, or the burglar may observe someone taking or putting the key back in its hiding place; this prompts them to come back when no one is home. Instead of hiding the key, keep the spare with a trusted neighbor or family member. Believe it or not, many burglars enter homes simply through the front door, side door, garage, or first-story windows. If you know the locks are damaged or broken, contact an emergency locksmith to repair or replace them as soon as possible. Deadbolt locks are more secure and make it difficult for burglars to enter your home. Your neighbors can be your best defense against a break-in. Get to know your neighbors well enough that you look out for one another’s homes while the other is away. If they witness anything suspicious, they will most likely be prompted to contact you and the authorities. Remember, storing your key on the outside of your home is a risky practice, and can lead to an easy break in. Always know who holds keys to your home, and install systems that make it harder to tell when no one is there. Also, keep everything locked when you are away, and when you are turning in for the night. This prevents anyone from simply using the front door or an open window to gain quiet access. 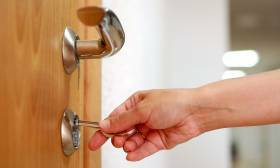 If you are concerned that some of your locks may need replacing or repair, contact a trusted locksmith to ensure the repairs are done correctly. Florin is a Digital Marketing expert and blogger who likes to research the latest trends in business, technology and marketing and writes about a range of topics. One thing that may catch your attention when you visit a local authority waste recycling centre is how efficient they have become. These days you will find specialist in areas of all types of waste. Here, we list a brief outline of what you can dispose of at these centers. At the recycling center, designated containers are provided for plastic and glass bottles at a waste recycling centre. You can usually throw empty drink cartons, along with aluminum cans, into the same container. If you have recently thrown a party at your home, it may be worth it to make a special trip to the tip to dispose of bottles, cans and cartons. This is the best way to prevent your recycling bin from becoming too full. VCRS, irons, DVDs and CD players can be disposed of and recycled in designated containers at the centre. Please be sure that the item in question is small and used by your household. While the above category utilizes TVs, there is actually a special cage for these items at recycling centres. It is interesting to see all the different models of televisions destined for recycling. Some are busted, broken and have been cracked. Others are simply old fashioned CRT models that have been replaced by today’s newer, flat screen models. Have you recently done some spring cleaning and thrown out a ton of clothing from the closets? Take it, along with all the shoes you no longer need to the nearest household recycling centre. It would be a shame to let clothing go to waste. The materials can easily be broken down to create other useful items. All of these car items have their own designated bins at recycling centres. The container for oil looks like a tanker type unit. You simply have to pour the oil carefully into the vessel and it will be taken away and disposed of using the appropriate, safe recycling methods. Tires are also used to make a wide variety of products, such as ground material for construction of public parks. Whatever type of wood or timber you need to dispose of, your local recycling centre can accept the unwanted pieces. The specialized pine material section is the area you will want to drop off your items. Lawn trimmings, hedge clippings, and tree clippings are also accepted at recycling plants. Certain foliages, such as the Japanese Knotweed, are not accepted however, since they grow at alarming rates and intrude the functionality of the plant. As you can see, there are plenty of other unwanted items you can dispose of at a household recycling centre. Take time to get to know your local plant, and contact them if you have any specific questions about the disposal of your items. Dublin Skip Hire supply a fully insured and reliable skips service and supply in Dublin and surrounding areas. 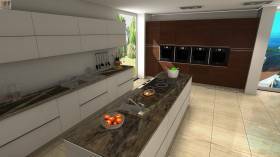 After taking the time to create a new kitchen space, home owners may find décor to be equally as challenging. Here are some simple rules to abide by when deciding how to decorate. Improve your little kitchen with wonderful decorating suggestions. A little goes a long way in a tiny kitchen, so get motivated by photos of inspirational areas that produce a balance of form and performance. Having a dose of constraint to stabilize your kitchen's small-scale, you are able to proudly display a variety, hang window treatments, and personalize the kitchen to indicate your lifestyle. Avoid consider what you've been told! Little kitchen areas do indeed have the potential to appeal just as much as their larger counterparts. Having a countertop that allows others to sit within the kitchen is a great way to make the kitchen an inviting space. Choosing the wrong height for countertops and chairs, however, will make it a challenge for guests to remain comfortable. An easy way to avoid this dilemma is to keep in mind the relationship in height between the two items. For example, a countertop that has a height of 36” would be best accompanied by a stool with a height of 25”. If you would like, you can simply memorize those two numbers, since most kitchens you see with this feature utilize this height for optimal comfort. If there is an island in the kitchen, pendants are a great way to add lighting; they can highlight the intricacies of the stone you chose for your island. However, placing them too high will draw attention to the pendant more than the rest of the kitchen, and placing them too low may interfere with the functionality and line of sight. If you follow the general guidelines above for the island height, the optimal measurement to hang your pendant is 28-34” above the counter. Or, in other words, hang it 72” above the floor. Many today are choosing to install cabinets with glass fronts; while these are very elegant cabinets, some find it challenging to decide what they should place inside them. If the cabinets seem cramped or cluttered, it takes away from the special quality of the display. If your kitchen is full of neutral colors or whites, you can utilize the glass cabinets to add pops of color in the form of vases or matching sets of dishware. Alternatively, if you do not wish to use this feature, clean white faced cabinets are always a good alternative, and with the right handles you can make them stand out on their own. Small measurements and final touches can make huge differences in how your kitchen looks in the end. By taking time out to research the correct measurements and décor, the kitchen space I far more likely to appear cohesive is design. This allows all who use it, and those who visit it, to take advantage of this central space without sacrificing functionality or safety. F. Aldea is definitely an Online Marketing communications consultant and blog author who loves to explore the hottest trends in business, technological know-how and marketing techniques and creates about a variety of stories. When it comes to looking after your home, most people are aware that home improvements can have a positive impact on the property. It doesn’t matter if you are looking to sell your home soon, if you want to stay in the property for many years to come or even if you are a landlord that wants to bring in the most income and achieve the best possible rental yield. There are incentives for every home owner to make changes and improvements at their property but of course, there are costs associated with caring for your home. This is why it is important for homeowners to know their budget and to consider what benefits they will receive from improving their home. There is a wide range of options to consider when looking to improve a property, which is good as this means that there is something for every budget, but this means that you need to know what your budget is. Depending on the work being undertaken and the professionals that are being hired for the role, there may be a need to pay all or most of the costs upfront. This is another factor to consider because not many homeowners are likely to have the funds they need for home improvements lying around. This is where a degree of flexibility with respect to your financing can make a big difference, and there are options to consider. When you make improvements to your home, you don’t want to change the style too much or make the home stand out too much compared to other homes in the local area. While you should be keen to make improvements that add functionality and utility to your home, if they change the style of the property, particularly with respect to traditional homes, it can actually harm the value of property. This is something that property owners need to be careful with. Then again, when you have an older home, upgrading in a tasteful, stylish and relative manner will have a bigger impact than similar upgrades in a modern home. Most modern homes should have a good enough standard to start off with, which means that there is less scope for as strong a return with these properties. If you have a modern home, it is often best to focus on the functionality a change will result in as opposed to merely looking to add as much value as possible. While the state of bathrooms and kitchens are very important to the value and functionality of a property, there is a growing sense that the return you receive for major work in these areas is not as attractive as it used to be. This means there is a lot to be said for making more modest improvements in these areas and saving money for other work. Adding decking to the outside of a property is great for many reasons. 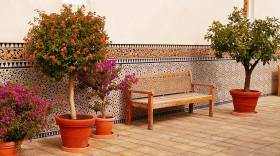 This can make a garden area the social hub for your friends and family, and this helps to create a fantastic first impression for potential buyers. Whether you are looking to stay for many years or you are considering selling, adding a decking area to your garden is an affordable and effective way to make improvements around the home and get a strong return on your money. Adding decking to a property is a more affordable home improvement option and it can still result in a return of around 73% for your investment. When you add in the utility you receive from a decking area, this is an option that adds short and long term benefits. If you’re looking to make home improvements but have concerns about short term funding, a guarantor loan may be right for you. This is an affordable way to generate the income you need to pay for all of the work while allowing yourself to pay it off over a longer period of time. Home improvements can transform a property, and it makes sense to think about the ways you can make your look new. Whether your focus is on the short or long term returns, home improvements are well worth considering. How many times have you asked yourself did I remember to lock the door? Having thoughts like this can really add stress to your day – especially if you’re away on vacation thousands of miles from home. At that point it’s really too late to do anything about it, but that won’t stop you from worrying about it. If you’re lucky perhaps you’ve got a friend, neighbour, or loved one you can trust to go over and check on things for you. Alternatively you just have to sweat it out for the rest of your trip which won’t add to the enjoyment of that vacation you’ve been planning for months to take you away from all the stress! With a few simple and relatively affordable home modifications and additions you can pretty much eliminate the insecurities you face when away from home. We’re talking about the use of smart home technology and how you can set up these technologies to act as your own personal security net around your home. That way you can relax on the beach with a cocktail and not have to worry about whether or not you left the door unlocked. Since we started this article talking about the traveler that can’t remember if they locked their frontdoor or not it’s probably appropriate to take a look at smart door lock technology and how it can help your piece of mind. 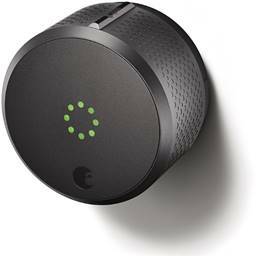 The August Smart Door Lock is one of the best systems on the market today and it allows you to control who has access to your home remotely using an app on your smartphone. You can grant visitor’s access by giving them virtual keys from within your app and you can set up one time access keys for service personnel as well. You can even set up auto lock and unlock. As soon as your smartphone is a certain distance from the house the lock will be activated automatically – that way you never have to worry about if you remembered to lock the door or not when you leave. It’s great for peace of mind. 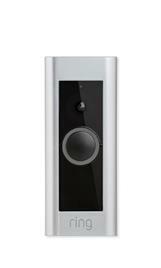 Another great option to help enhance your home security system is the installation of a video doorbell. Our favorite is the Ring Video Doorbell. This smart little device has a built in camera with 1080p HD video that can automatically record visitors on your doorstep as soon as it senses movement in its vicinity. This isn’t just a recording device though. It’s also a two-way communication tool. You can use the video camera to see who’s at the door and you can talk with them using the built-in two-way speaker system. All of this is done through an app on your smartphone so it doesn’t matter if you’re in the house or on the other side of the world – that person ringing your doorbell won’t know the difference. If it’s a burglar this will likely scare them off in short order. In many cases a burglar will scope out your place before approaching looking for signs of life. That’s where a system like the Caseta Wireless smart lighting dimmer kit can really come in handy. You can use this system to schedule what time your lights turn on or off automatically, but that’s not the coolest part. This system can actually turn lights on or off at random intervals to give the appearance of someone moving through your house and turning lights off and on. It’s a great tool in your efforts to deter intruders. 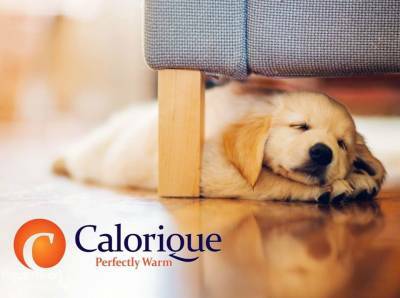 It isn’t just unwanted guests you have to worry about when away from home – there’s also the possibility of an accidental fire or a dangerous build-up of carbon monoxide which can put the lives of your pets left at home at risk. Nest is well known for making one of the best smart thermostats on the market, but they also make a smart home fire alarm and carbon monoxide detector combo device. This handy device can send alerts directly to your smartphone allowing you to react to a problem quickly and contact emergency personnel before it becomes a bigger problem. These examples are just the tip of the iceberg and represent a striking change in the way we approach home security. The best part is these devices are priced low enough to make them affordable for the average consumer. 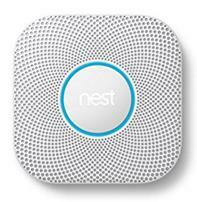 There’s no reason not to believe that most homes will be protected by these and similar devices in the near future. Woodworm are the larvae of several different species of beetle, wood boring beetles lay their eggs in the natural grooves and crevices that can be found on wood. Once the eggs hatch the larvae can cause serious structural damage to a property, a woodworm infestation is bad news and should be treated as soon as it is found. The tell-tale little holes that woodworm leave are actually exit holes so many people don't notice an infestation until after the larvae have hatched, wood boring larvae can live in wood for up to ten years so can cause serious damage before they are spotted. Many wood boring beetles take flight and start looking for spots to lay their eggs around April time, keep your eyes open and you might see some of the below over the next few months. Platypus cylindrus is the only member of the ambrosia beetle family found in Britain. The larvae of this beetle don't actually eat wood, the ambrosia beetle digs tiny holes into the wood and then infests it with a ambrosia fungi. The beetles and fungi have a kind of symbiotic relationship since the fungi needs the beetle to spread it and the beetle eats the fungi. You can learn more about the ambrosia beetle here. Ambrosia beetles like damp conditions so as long as you keep your home dry you should not have a problem with them, look for leaks in the roof, around your washing machine and keep condensation under control. Pentarthrum huttoni is not a species indigenous to the U.K, this beetle is indigenous to New Zealand. The first recorded U.K sighting of this species was in 1937. The first domestic U.K infestion of pentarthrum huttoni was recorded in 1947. This beetle grows up to 3.6 mm in length, it has very small protruding eyes and is dark brown in colour. This beetle has a 3 to 4 year life cycle and lays its eggs in the exit holes produced by previous larvae, adult furniture beetles do not feed they only reproduce. If you have a modern home you are probably safe from an infestation of this species, the death watch beetle larvae only likes to feed on rotting hardwood. Larvae can spend up to 10 years inside infected timber and when they emerge as adults they can measure up to 7mm in length. To attract a mate, the death watch beetle bangs its head against wood, this banging produces a tapping sound. This beetle is common in modern homes because it likes to lay its eggs in softwood timber. The house borer beetle can have a lifespan of up to 10 years. The house borer is dark brown in colour, it has long antennae on the front of its head and white hairs on its body. This beetle is similar to the death watch beetle in that it likes to attack hardwood but unlike the death watch beetle it is not common in old houses. The powderpost beetle likes to lay its egg on wood with a high starch content, as wood ages it dries and loses its starch content. As we said above many species of wood boring insect like decaying, rotten wood. If you have an infestion you will want to remove any damp and rotten material from your home. Damp is not good for the health, it can cause all sorts of respiratory problems, rot wood and other building materials. Dry rot and wet rot can cause just as much damage as woodworm so the removal of any damp is a good idea regardless. Once you have located and removed any damp, you will want to remove any structurally damaged wood and treat the area around an infestation with an insecticide. Insecticides such as Boron Gel can be bought cheaply online or from your local hardware store, many insecticides can be sprayed on to an infestation or applied with a paint brush. You can treat an infestation yourself quite easily but woodworm can cause serious structural damage, to ensure an infestation is fully eliminated it maybe best to call a in a specialist. This post was written and supplied on behalf of Peter Cox, woodworm control and treatment specialists. As we get further into 2017, you may be thinking about giving your flooring a revamp to celebrate the new year. But, if you’re going to go through the hassle of reflooring your home, it’s worth checking out some of the top flooring trends coming our way this new year. Gone are the days where people notice new carpets. Instead, folks throughout the Pacific Northwest are turning to vinyl. Vinyl flooring has made some pretty serious advances in the past couple of years or so. It’s is getting more luxurious, more colorful, more resilient. But it’s not the only flooring option either. If you’re going a different direction with your flooring this year, carpeting needs to be bolder, and ceramic tiles are getting bigger. That’s right, “luxury vinyl”. You may be wondering where anyone could find such a thing but, trust us, it exists! Luxury Vinyl is the new and improved, popular product taking over the modern age of flooring. Thanks to technology, the old, tacky vinyl we all know and hate has given way to a clean, beautiful, and even eco-friendly option. Vinyl flooring is more durable, pet friendly, and child friendly. Also, vinyl is water resistant and extremely easy to clean. Luxury vinyl is suitable for multiple rooms and is DIY-friendly. New vinyl floorings comes with a number of installation methods, saving lots of money in the long run. Vinyl comes in all shapes, sizes, and colors. The rapidly approaching new year is earmarked by a decided rise in popularity for vinyl options that imitate other materials. Some of these imitations include tile, stone, or even marble. Wood of every conceivable shade, pattern, and color are available. Of course, imitation tile is likely met with instant skepticism - but hold it until you see it. These vinyl flooring imitation pieces are extremely realistic and genuinely beautiful options. If you’re going concrete, however, you may want to remember a few things. First of all, concrete flooring is, well — hard. For families with small kids that decide to favor the concrete trend, remember to use area rugs to provide soft surfaces, warmth, and some additional style to the area. Last year, it was all about cool and white tones. Today, everyone is going towards warm and rich materials such as terracotta. In the 80’s terracotta was used as a border tile, today these tiles are naturally matte and are becoming most popular for use in bathrooms and kitchens. Terracotta is a great way to give your home a rustic, cozy feel. Pair it with a few terra cotta planters and some lemon trees, and you’re practically in California. Carpets will likely never go out of style. Most people would opt for carpet because of the comfort factor, despite the numerous other flooring options. So, if you’re on the team that favors soft, cozy flooring options, we’ve got tips to the carpet style guide coming our way. A style of carpet that has caught the eye of trend forecasters worldwide is the cut-and-loop carpet. This is carpet that actually has a pattern in the weave, creating geometric shapes, swirls, and other designs throughout the actual carpet. Crazy, right? Instead of shags and friezes, people are opting for these patterned carpets to add some subtle flair and visual interest to homes. With the rise of the eco-warriors has come some new types of wooden flooring that are growing in popularity. Bamboo has been around for a long time, true, but it is now being reintroduced in a far more broad array of colors. While you might think bamboo is nothing more than a fast growing grass, bamboo is actually classified as a hard wood. These beautiful planks can be narrow or wide, and will add a touch of modern elegance to your digs. Hipsters, rejoice! Classic looks using new technology are on the rise for 2017. Reclaimed wood from new factory-finished hardwood flooring is all the rage. Let us say it again — all the rage. This unique solution offers all the charm of reclaimed timber without the expense of salvaged lumber. And, well, the splinters. A primary benefit of factory-finished reclaimed wood is that, unclaimed it’s authentic counterparts, it is very resistant to moisture fluctuations. This means minimal wrapping and shifting, regardless of humidity levels. Cork offers a level of comfort that other hardwoods do not. Many people will be opting for cork instead of hardwood because of the amazing acoustic insulation it offers. The biggest factor pushing people towards cork flooring is the fact that it no longer comes in just blonde. Today, you can find cork flooring in an array of palettes thanks to its factory finish. This also allows the flooring to be more durable. It’s worth noting that cork is very prone to moisture damage and fades quickly with light. Going green is something everyone is taking more and more seriously in the 21st century. From cutting down on natural resource depletion to a focus on recycling, we are trying just about everything when it comes to being more responsible for our environment! Below are some of the top eco-friendly flooring ideas coming to the surface for 2017. Many carpets today are piled high with toxic pollutants. Not only is this bad for the environment but it could also be detrimental to your health. Companies today are offering carpets from recycled materials. Carpet is hard to recycle as it made up of so many different types of materials, however, organizations are now offering this product from the get-go. At Carpet To Go keeping up with our customers choices is important to us. We want to help you make the right choice from both an aesthetic and environmental point of view. If you’d like to discuss the various options available to make your home more stylish while reducing your carbon footprint, pick up the phone and call (206) 382-1253. Alternatively, get in touch with our flooring experts for a free consultation here. I'm the marketing manager for Carpet To Go, a Pacific Northwest carpet and flooring installation company. At home, I love to spend time with my wife and 2 kids and play golf every chance I get. At work, I help connect my clients to their customers through content that helps people solve problems. At Thurston Building Systems we have a dedicated team of designers and developers who can create a building that will provide all of necessary facilities and dimensions for you to be able to make the most of it. We understand that everybody has a different view on how to utilise a room and the different benefits it can provide to the end user. That is why we approach every project with a clean start and never use a one size fits all template. Through the development of your construction process we have begun to realise it is important to really spend time listening to your ideas so that we can carefully tailor the design and build to meet your specific needs and expectations. Plus, as well as ensuring that we are your requirements are fully heard and incorporated, we long history in the field of modular, portable and specialist buildings provides us with the knowledge to advise on aspects of each project and suggest additional ideas to enhance and improve both the function and appearance of your development. You can rest assured that our specialist in-house experts will design and tailor your proposed building to your exact specifications, inside and out. We like to make sure that we do things face-to-face so that you know who we are and we get a real sense of what you want to achieve. From requiring an ultra-modern high spec building to wow clients in or a more traditional-looking building to blend into your current surrounding, your options are practically unlimited. We aim to deliver and design a building that is both aesthetically pleasing and also practical. Once we have fully understood your brief we’ll prepare an initial proposal, including cost estimates and space plan. From there we welcome amendments and changes to ensure that you’re going to really love the building. It is here where the ideas in your head really do seem to come to life and lets you see the real potential it can make to your business or home life. With a dedicated project manager, we take your build from design to paper as efficiently as possible to ensure that your new building reaches site when you need it. Plus, with a project manager knowing all of the ins and outs of your project we’ll begin to understand how your building will be delivered and pre-empt any problems that may occur. It provides you with complete peace of mind. Modular, portable and specialist buildings are not purely for business use, they can make a great habitable space at a lot more affordable price than traditional homes, especially in towns and cities where property prices are constantly growing and show no sign of slowing down. From schools, sporting facilities to the health sector, we have a range of buildings that suit every need. We want to make sure than any project we undertake is going to really benefit the client for years to come. That’s why our bespoke designs are incredibly important to provide the right balance of aesthetic design alongside practicality. It is merely a myth that selling a home in the middle of winter is an impossible feat, even though the bleak days, cold weather, and holiday festivities may mean you see less buyers interested in a showing than usual. The fact is, the number of homes being sought in the winter by buyers can be lower, but those on the lookout for a house are often very serious about finding a home and more willing to make an offer. 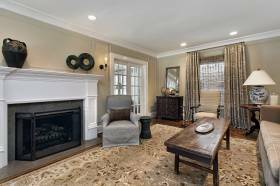 Part of successfully selling your home in the winter relies on you as the seller. So grab your snow shovel, get the place nice and toasty, and increase your chances of selling your home in the winter with these easy tips. Keep tabs on the weather. If there is one thing you cannot control or sometimes even rightly predict in the winter, it is the weather. You could book a showing on a Monday afternoon expecting no snow for later in the week, and then see an all-out blizzard on the day of the showing. So if you are trying to sell your home during this sometimes volatile weather season, you will need to keep tabs on the weather. If you spot a snow storm on its way after you've scheduled a showing or open house, reschedule right away. The last thing you want to do is leave potential buyers in the dark when arrangements must be made because of the weather. Get cozy with the snow shovel. In normal winter scenarios around your house, you may skip shoveling altogether and choose instead to only leave the house in snow boots. However, if you want buyers to be more interested in your property, it is a better bet to keep the walkway, driveway, and porches cleared of snow as much as possible. No buyer wants to show up to take a look and find that even pulling in your driveway appears to be a challenge. Use snow to your advantage. There's something charming about a snowman parked in the front yard in the winter, so don't hesitate to gather up the family and create an impressive one to welcome prospects. You could even get creative and stick a for sale sign in the snowman's hands or dress him up in a real estate t-shirt or cap just for fun. Take it easy on the holiday trimmings. Through the winter, there is bound to be some change in the outward or inner appearance of your home if you celebrate the holidays, but don't get too over-the-top with your decorative efforts. While clients will want to envision a happy holiday home at certain times of the year, going overboard will make it hard for them to focus on the house at all. Skip the pieces that could be considered tacky r gaudy, like plastic Santas and giant lawn ornaments, and instead go for classic decorative items like small twinkling string lights on a front-door wreath or garland on the banisters of the stairs. Keep your home nice, warm, and inviting in spite of the cold. No one likes a cold and drafty house in the winter because this in no way feels inviting or cozy. If you usually keep your thermostat turned down and wear sweaters and wool socks around the house, make sure you crank up the heat a few hours before a prospect is scheduled to stop in for a visit. Your home will be much more appealing to a buyer if they step inside and immediately feel warm and comfortable. Getting multiple offers for your home is a dream. Every seller wants to be in such a position? The alternative, receiving too few, or none at all, is much worse. 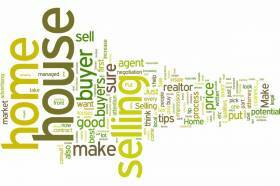 So, usually sellers who receive lots of buy offers begin thinking they are in the money. All will go well. They have beat the odds. Well, not so fast. If your home is on the market and has a bevy of prospective buyers, it is time to strategize more than you may think. Never let your agent mislead you. Things can still go awry. In fact, in this current real estate market, that is often the case. To help you survive the real estate selling game unscathed, following are the top strategies and possible pitfalls for multiple buy offers. “Buy low, sell high” is the central maxim of all investing. Yet, never let that entry-level Economics course in college fool you. External factors, beyond your immediate control, can mean having to throw out traditional economic theory. For example, the highest bidder may suddenly inform you that they cannot come up with the funding. Perhaps their offer proved so appealing because it was impossible to begin with. If you have turned away other prospects, they may be unwilling to return to the table. And, even if they do come back, they will probably be less cooperative this time. You may walk away with less than expected , because of believing in the ability of the highest bidder to come through. Sometimes, if it looks too good to be true, perhaps it is. Informing all bidders of the highest offer and asking them to counter is another popular strategy. You will now have the chance to set the lowest possible price. Everyone will have to beat that number. Do be aware that this method of negotiation can turn off some prospective buyers. Families, in particular, who may not have much to offer, but really want to buy, can feel slighted. They may stop returning your calls. This tactic avoids some of the complications mentioned in point two. You can counter the offer of one buyer and deal solely with them. Quite often you have a certain sort of buyer in mind. For example, if there is a family involved, you might want them to have the chance to negotiate absent outside distractions. Sidelining all other offers and working out the best deal for you and the family benefits you both. Cash rules in the real estate game. When a buyer has cash in hand, you can usually count on the deal going smoothly. The fewer bankers and lenders involved, the better. The only real downside of cash buyers for sellers is that most are quite savvy. They have had to use their wits to accumulate and hold onto so much money. These buyers will usually want to include various stipulations and contingencies in the home contract. Watch out, because the contract can work overtly in their favor. One common contingency in cash contracts is that the buyer has to first sell their present home before closing on your property. You could wind up waiting months, or longer, for this deal to close. Armed with these strategies, you are ready to tackle the real estate market. Just be sure to understand all the possible pitfalls associated with handling multiple home offers. Never assume a deal will close until it actually has. Having an unblocked chimney that is unused during the winter will bring in draughts that would be easily avoided otherwise. Not addressing the issue means your home’s warmth will escape, thus increasing the use of energy. If you happen to never use the fireplace, then you would do better to cap it off to minimize the potential loss of heat and energy. Use an inflatable chimney balloon if you want to keep it operational or wall it off entirely if you plan on never using it. Make sure you work on cleaning your chimney to keep things looking good and to avoid spilling dust all over the place. You can use a cleaning company that specializes in chimney cleaning to make this work if you don’t have the time or experience in doing so. Using one of these will allow you to monitor power consumption in your home as well as making sure you figure out which appliances have the biggest draw and ways you can make a difference by addressing the issue. Using a professional electrician will give you a chance to install it with perfect results, so make sure you consider that option when you work on using it. Heat can be lost easily via cracks and holes in your walls, but you will be able to save up some money and keep your energy bills low if you ensure good insulation. Cavity wall protection will allow you to cover energy saving in a better way. This is one cheap and fairly easy solution you can work on, but it is often avoided due to its poor aesthetic appeal. You can use that to block any draughts that happen to come under doors, around your windows and pipe work, as well as loft hatches and other locations that lead to the outside. You will need to do some cleaning once in a while, but in the end said cleaning will be worth it as blocking these areas will make them harder to deal with. 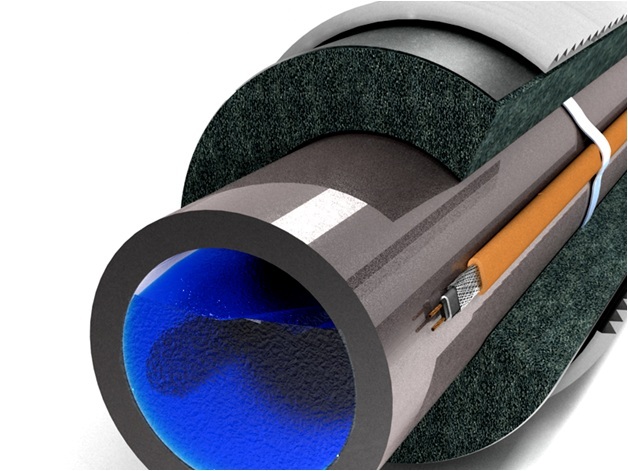 Draught excluders can also be installed in your home to keep things under control, but overall eliminating these gaps will be the only way you can improve your home’s energy efficiency. When people are searching for a home to buy, sometimes an idea, or a feeling, are just as important as the actual features when it comes to getting them to make the purchase and agree to a good price. A recent study by Zillo Digs, suggests that listing a "barn door" might help sell a home faster and at a better price, than one that does not have this listing. This does not refer to a literal barn door, but rather points to some ideas that people view favorably when considering the design of a place they might like to buy. The Zillo Digs company studied 2.8 million listings for single family houses and condos listed around the nation from January 2014 through March of this year in their study. The study used a complex model that measured attributes, as opposed to those that did not have those attributes, and how fast they sold and for what price they commanded in the market. The people who did the study pointed out that just listing "barn door" by itself is not what makes a house sell. Rather the words convey an idea of how the place is designed. A barn door is not the traditional opening to an outbuilding where animals are kept, but is more a design feature that gives the idea of open space. Barn doors are generally sliding doors and come in all types of shapes, materials and sizes. Here are the top four items on the list and the impact it had on price. What these four items have in common is the idea of simplicity, or a rustic atmosphere, which is very popular now. It also conveys the idea of an earlier time when function was the guiding force. Even so these items are not cheap. "Barn doors" may be made of stainless steel and cost as much as $3,000, and farmhouse sinks are made of stainless steel and are also rather costly. 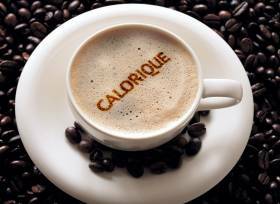 Even so they may be worth the cost, the study suggests. The study also showed that some items that may have helped sell a house even 20 years ago, are not as effective today. While these are still positives, they are not as positive as they would have been a couple of decades ago. Some of this is semantics with changing times. The words "pendant light" adds 4.7 percent to the price, over the chandelier at 1.8 percent. The two items are not that different, but pendant just sounds a lot more modern than chandelier. Rounding out the study, some things have fallen in popularity. The term "breakfast nook," once very popular is now No. 50 and barely affects the price. Fireplace, walk in closet and outdoor kitchen, are also things that once would have added value, but now seem to have virtually no effect, the study said. Your air conditioner might be largely forgotten as the cooler months set in, but that next heat wave may be on its way. Switching on the AC after a long, system hibernation is often a recipe for failure. As an alternative, consider a basic maintenance schedule that will help you save money over the years. When you care for your AC system on a regular basis, it'll last longer and cost you less in upkeep costs. The simplest task that you can perform for the AC is replacing the filter. Every system uses a rectangular or square filter that captures dust and debris. Over time, this filter fills up and creates a veritable blockage to incoming air. As a result, your AC system works harder to pull the air into its components. This extra stress wears down parts and causes more costs over time. Replace the filter once a month when the AC is being used on a regular basis. The outdoor component to your AC system has a collection of fins around the coils. These fins direct air across the coils in order to cool the refrigerant. Because this system section resides outside, these fins become damaged over time. They might bend and block air flowing across the coils, which reduces the system's ability to cool the interior. A simple tool that you can use at home is a fin comb. Simply "comb" the fins so that they're parallel to each other. The system will work almost perfectly with straight fins. Your AC unit has several leak points that should be accounted for on a regular basis. Access the indoor unit, and look for the condensate drains. Made of PVC pipes, these drains should allow drips of condensate to funnel out of the system and into the home's plumbing. Leaks shouldn't be found on floors or under the AC unit itself. Take a close look at the refrigerant hoses too. If any of these hoses are leaking, contacting a professional is your next step. Part of a successful AC maintenance schedule is hiring professionals at least once a year. These technicians can test areas that require special tooling, such as refrigerant levels and temperature-sensor accuracy. Ideally, schedule an appointment in the spring before hot weather arrives. If there are any major concerns to address, the technicians can work them out before the outside temperatures become too uncomfortable. Professionals complement your maintenance, and allow the system to work for a longer time period with fewer repair costs. Shine a flashlight across your interior AC unit, and look for any accumulated dust. Use a vacuum extension to gently remove any dust along the coils. A dirty AC system must work harder to produce cool air. Dirty coils can't properly transfer heat, but clean coils will allow the system to work perfectly with each cycle. Clear dust and debris from your exterior unit too. If you suspect that there's an electrical problem with your AC, consider calling a technician and electrician. An AC technician is entirely capable of troubleshooting the system's electrical components, but there might be other underlying issues that require an electrician's expertise. Don't postpone your AC maintenance, especially if electrical problems are involved. Safety should be your top priority.